Silver Mounted. Full Lined Frog has oversized pearl eye. Step up Pernambuco stick available in round or octagonal. Nickel mounted. Also known as BL80. Violin model shown. Silver Mounted. A great step-up choice for a rapidly advancing player. Octagonal stick. Half lined frog. Nickel mounted. Octagonal. Full lined frog. Nickel Mounted. Octagonal Stick. Nickel Mounted, full lined Frog. 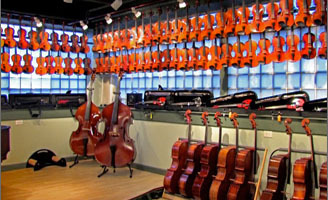 Violin model shown. Silver Mounted. Good Pernambuco Stick. W.E. Dorfler 3 Star Special Silver. Octagonal stick. Nickel Mounted. 3 piece button. Violin model shown. Fine Pernambuco. Silver Mounted. 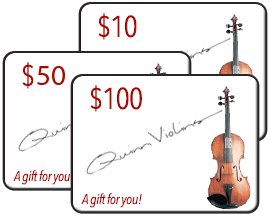 Violin model shown. Octagonal Stick. Nickel Mounted. Upgraded pernambuco material. Violin model shown. Very good, round or square Ceylon Pernambuco stick, ebony frog with Parisian eye and inlaid slide. Nickel Mounted. Violin model shown. Selected Pernambuco wood round stick, fine ebony frog, full silver mounted with pearl eye, combination silver and leather grip. Violin model shown. Round Pernambuco stick. Nickel mounted. L'Archet Brasil. Sustainably produced in Brazil. Good pernambuco stick. Nickel Mounted. Ideal for advancing students. Violin model shown. Aged Pernambuco wood; snakewood nickel mounted frog; silver or whalebone winding, beautiful Mother-of-Pearl slide, bone tip, goat-leather thumb-grip. Violin model shown. Sterling Silver Fully Mounted Frog Pernambuco Bow. 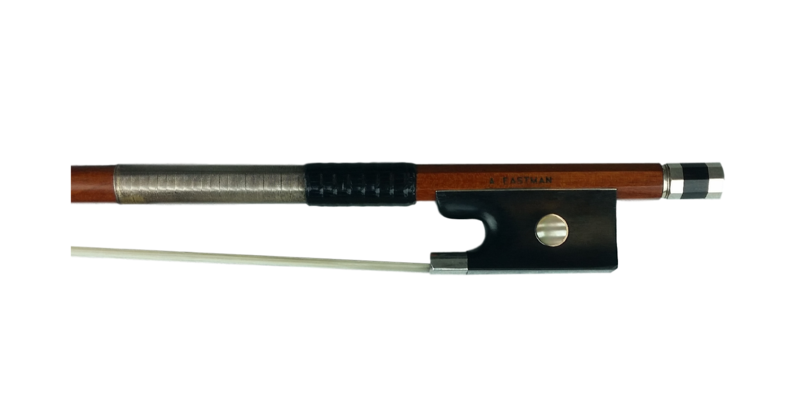 This is the high value, Silver level bow that is a very popular choice with advanced students. Violin model shown. Aged Pernambuco wood; fully-mounted silver frog with Parisian eye, beautiful Mother-of-Pearl slide, silver winding, lizard-leather thumb-grip, unique design on shaft (round top, octagonal at the bottom), bone-tip. It has excellent playable features. Violin model shown. Aged Pernambuco wood; crafted after French bow-making school style, proprietary frog styling, lizard-leather thumb-grip, goldfish slide, solid silver or silver tinsel winding, bone tip, frog is finished by bowmaker himself. Violin model shown. Aged Pernambuco wood; crafted after French bow-making school style, proprietary Fleur de Lis style frog, lizard-leather thumb-grip, goldfish slide, solid silver or silver tinsel winding, bone tip, frog is finished by bowmaker himself. Violin model shown. Aged Pernambuco wood; crafted after French bow-making school, proprietary frog styling, lizard-leather thumb-grip, goldfish slide, solid silver or silver tinsel winding, bone tip, solid silver button, frog is finished by bowmaker himself. The frog and button are specially made for Larchet Brasil. Violin model shown.